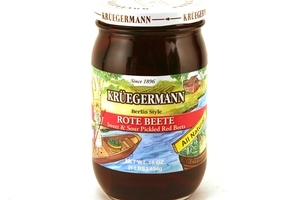 Kruegermann Sweet and Sour Pickled Red Beets in 16fl oz, glass jar. Rote Beete is made from steamed beets which are sliced and then packed in sweet and sour brine. Our beets are made from the finest beets we can find and then packed using the more time consuming old fashion methods. They can be eaten by themselves or along with a meal. Product of Germany. Diluted Red Vinegar - 4.3 fl oz.